I won’t lie: I needed a shorter movie to watch so I could meet my quota for the week. Desperate times call for compact movies. 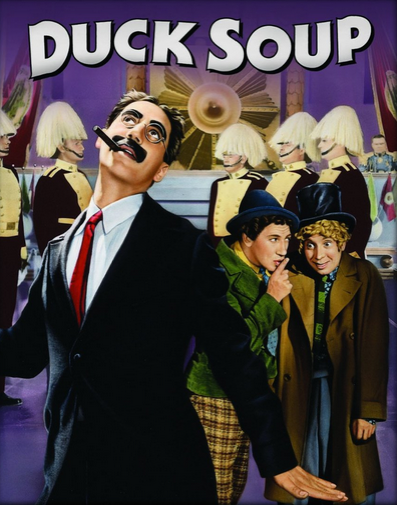 But Duck Soup‘s a classic in addition to being only around an hour long. Everybody wins in this setup. We’re just so lucky that there’s a lot of very classic films that are short by today’s standard. If there’s anything that this challenge has taught me, it’s that a good movie doesn’t have to be long to be good. There’s some great movies that are around two hours or longer. But those aren’t all movies. I frankly don’t have half a day to spend at the theater, thank you very much. Just concentrate on writing the good stuff, people. The gist: All four Marx brothers are in on this film, with poor Zeppo being the straight man to the outsized characters of Groucho, Chico and Harpo. Groucho’s Rufus T. Firefly (note the nod to this character within The Devil’s Rejects) rules the fictional country of Freedonia. All is not well in Freedonia—the country’s broke, the people are unhappy and the country is crawling with spies. Some of them are trying to start a war so that the poor country ends up under the control of another, one with a much more square leader. Firefly’s here to set things straight! If he can stay away from the lovely Mrs. Teasdale, that is. What I “learned”: There’s humor, and then there’s organic humor. This movie can’t really compare to any humorous movie I’ve ever seen because frankly they don’t make them like this anymore. Most jokes in humor movie are incredibly scripted, hardly ever working with intonation or wit within the movie itself. Oddly enough, the movie within the challenge that comes to mind first is The House of Yes. That’s truly the only other time that people use intonation as humor instead of the script itself. Why? It’s definitely a way to make the audience laugh with minimal effort. This movie earned three slots on the list of the Best Movie Insults, more than any other movie. It’s amazing how much delivery matters with comedy. It still matters today. Maybe it’s just that no one apart from Robert Downey Jr. and Tig Notaro has realized it. See this movie if you like: People who work miracles with words. Between Groucho and Chico (playing an Italian spy, because why not) words mean absolutely nothing. Their delivery’s so quick, you probably wouldn’t even realize you were insulted if they talked to you on the street. It’s a wonder they didn’t get smacked upside the head half the time when they were growing up. Or maybe they did, and that’s why they became professional actors. Avoid this movie if: There is no reason to avoid this movie. It will melt your mind and re-fuse it. You will not see comedy the same way again. Every Bugs Bunny cartoon will make sense. And it’s only an hour and a half, ya bum. What’s your excuse?